Participating in the Patchogue Kiwanis Charter Night Celebration and Sweepstakes Fund Raiser are Kiwanian Notables pictured here. 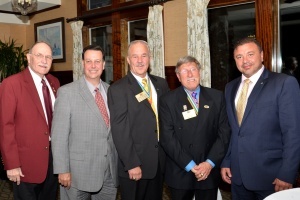 From the right are current Patchogue Kiwanis President, Michael D’Ambrosio; Past Distinguished NY District Governor, Joseph Corace; Past NY District Governor, Glenn Hollins; Past Distinguished NY District Governor, Albert Norato, Jr.; and Past Distinguished Patchogue President, Walter Ladick, Jr.. Kiwanians and guests gathered at Snapper Inn to celebrate the club’s achievements in Child Service Projects both locally and internationally. 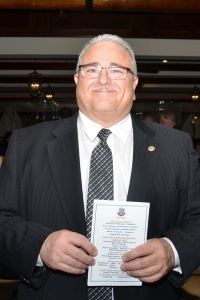 The event also raised funds to sustain these projects which include Sports Team Sponsorships, two Key Clubs, Venture Crew, Scholarships, Camperships at Kamp Kiwanis, Holiday Food Baskets, Christmas Toys and Patchogue Medford High School Robotics Team. Angelo Tarantino did an outstanding job of chairing the social side of the event and Joe Ilg and Patrick McPeak did an outstanding job in conducting the sweepstakes drawing. 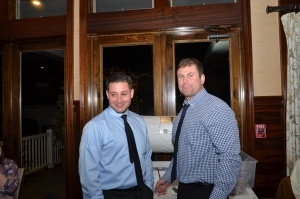 The club is known in the Greater Patchogue community as “Champions to Children”.